As Curator of Collections and Exhibits (and “other duties as assigned”) my time isn’t always evenly divided. “Other duties” often take most of my time and I don’t spend as much time with collections (three-dimensional stuff) as I would like. When I do, I spend time wandering around the storage area and pondering things. The current pondering involves early recording cylinders. I’ve written about early acoustic recordings and provided links to audio files of music by famous performers who came to Geneva. This blog is about the objects themselves. 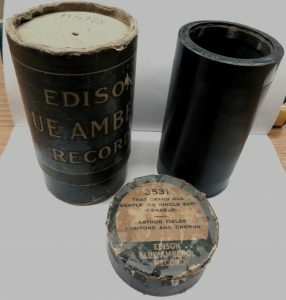 We have shelves of Edison Record cylinders, each with the image and signature of Thomas A. Edison, that I thought were identical. Upon closer inspection I found six different types of cylinders. Here’s a quick history of recorded music. In 1877 Thomas Edison invented the phonograph that recorded on tinfoil cylinders. He moved on to experimenting with electric light and left others to develop the phonograph. A group led by Alexander Graham Bell spent the next decade improving the recording medium, at which point Edison returned to the phonograph. 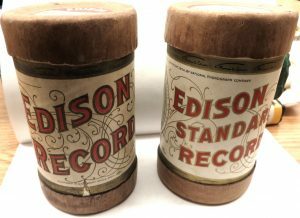 By 1889 the Bell and Edison laboratories agreed to share patents and settled on a standard all-wax cylinder. Several sayings that we associate with recorded music date back to the 1890s. Sometimes records are called “stacks of wax” or “wax tracks” even though wax was replaced by plastic in the early 1900s. The first customers for phonographs were amusement parlors that charged five cents to play a record, hence the nickelodeon. Cylinders were stored in cardboard boxes that looked similar to canned food. Mark Twain coined the phrase “canned music” which is still around today. Every technology has a competitive stage during which companies sell machines that only play their format. I recall the early Beta/ VHS videotape wars of the 1970s and 80s over format and tape length. The phonograph was no different. In the 1890s the first battle was between cylinders and discs. Discs, or what we call records today, and their machines were cheaper but the audio quality was not as good as cylinders and their playing life was shorter. Early wax cylinders could be recorded at home and shaved smooth for re-recording. The early victory went to cylinders. 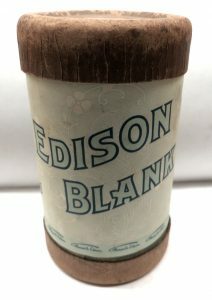 The early Edison Records had no artist label on the box and only the name of the piece on the cylinder. Later packaging included the musicians on the lid. Improvements were made in the production and playing life of cylinders. 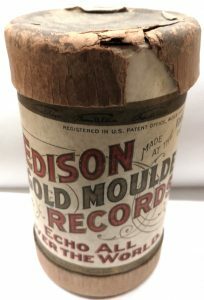 In 1902 the Edison Gold Moulded cylinder was made with harder wax and pressed from a metal mold that could produce several hundred records. A thin layer of gold was used in the creating the mold, but really, Marketing 101 tells us that adding “gold” to a product name makes it more desirable. Edison’s next advancement was the Amberol Record in 1909 which doubled playing time from two to four minutes. The National Phonograph Company, Edison’s record label, didn’t really know what to do with the extra time. Songs were re-issued on Amberol with an extra verse or instrumental passage. It reminds me of record albums re-issued on early compact discs: the potential of the new format exceeded the amount of original content. Other inventors were ahead of Edison in developing new cylinders. In 1900 Thomas Lambert received a patent for mass-producing celluloid records that wouldn’t break when dropped and could be played thousands of times. Edison took Lambert’s company to court for copyright infringements that didn’t exist and eventually forced the company out of business in 1906. 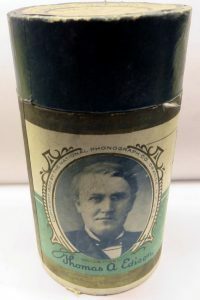 Edison acquired Lambert’s patents in 1912 and introduced a celluloid cylinder, Edison Blue Amberol. Meanwhile, the audio quality and playing life of discs had also improved. Beginning in 1908 records were pressed on both sides, providing more music in less storage space than cylinders. In 1912 Columbia Records stopped selling cylinders in favor of discs and Edison introduced his own disc format. Edison sold cylinders until 1929 to support owners of his machines but that particular format battle was over.